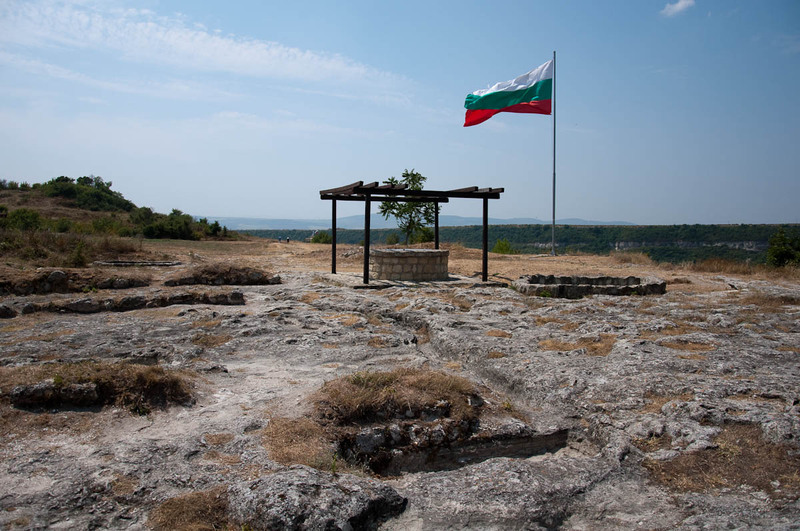 Even though I was born only about an hour away from Ovech Fortress in Bulgaria, I admit that I had never heard of it until very, very recently. In fact, not many people had either. 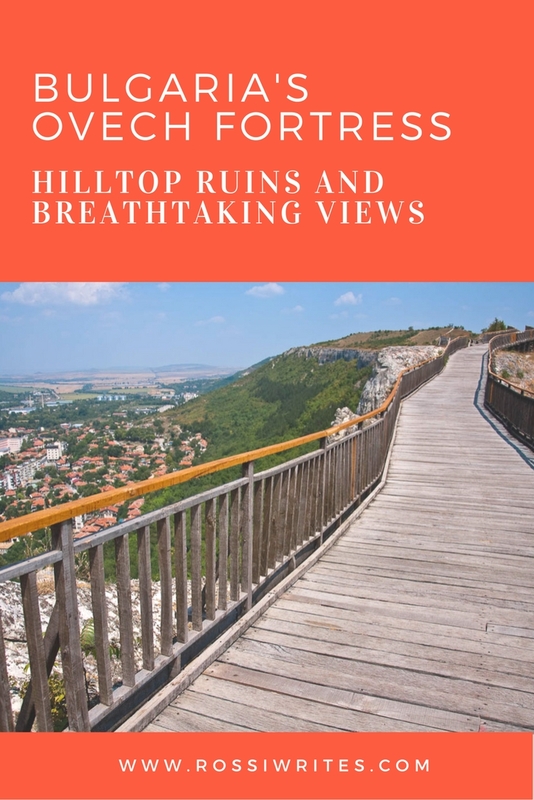 For centuries the fortress had been abandoned to the whims of time and destruction on top of a steep plateau affording wonderful views over the nearby lush valleys and craggy hills. 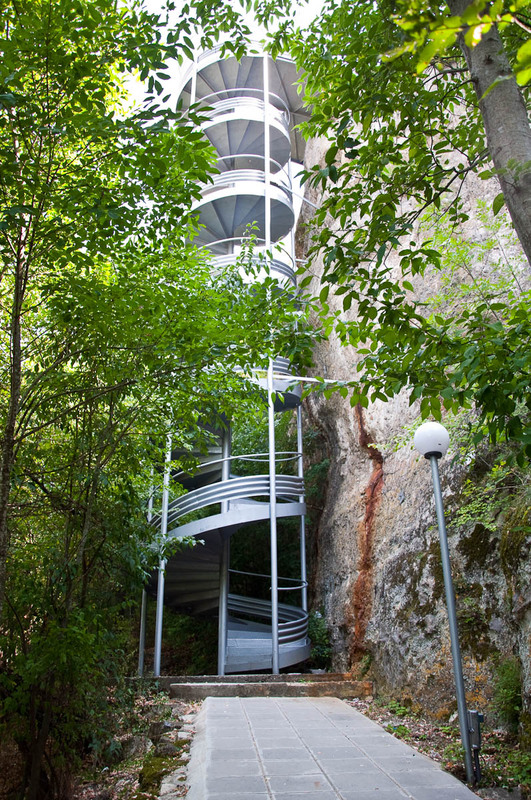 A few decades ago, a metal spiral staircase was mounted making it possible to reach with some ease what had remained of the once mighty Ovech Fortress. 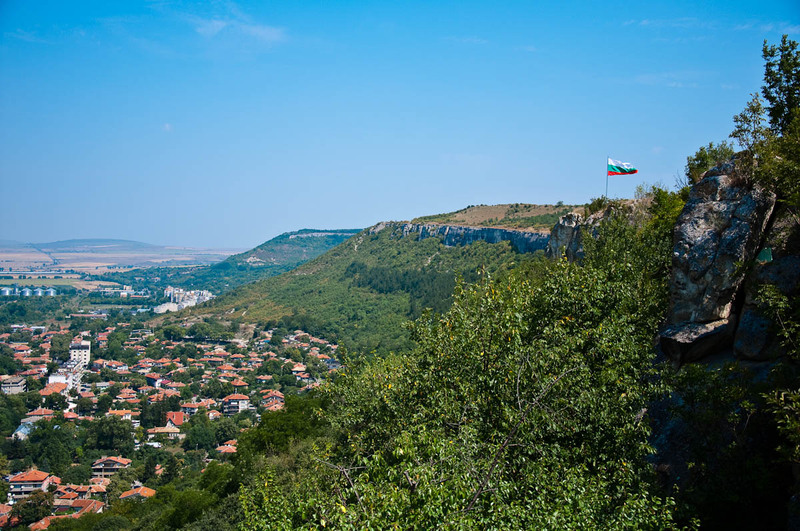 Yet, very few people, mostly locals, would go up there to see for themselves what had been an important military and administrative settlement in the history of Bulgaria. Then, all of a sudden, all travel channels in the country were awash with drone footage of the ancient fortress and its mighty wooden bridge. The camera swooped along the rocks where huge fortifications had one stood, it followed the curve of the bridge perched atop of a steep cliff and, in the deep valley down bellow, the town of Provadia huddled with its red rooftops and rectangular blocks of flats. And just like this, everyone wanted to know more about Ovech Fortress and wanted to visit it. Just like me. The fortress had had a tumultuous history – alternating between being used and abandoned for centuries at a time. It was originally a Byzantine fortification called ‘Provaton’ (literally the Ram Fortress) in use from the 4th to the 7th century. It was destroyed by either the Huns or the Goths, there are no definitive historical sources to confirm which. The Slavic tribes moved to these lands around 640 AD, closely followed by the Proto-Bulgarian tribes which founded Bulgaria in 681. 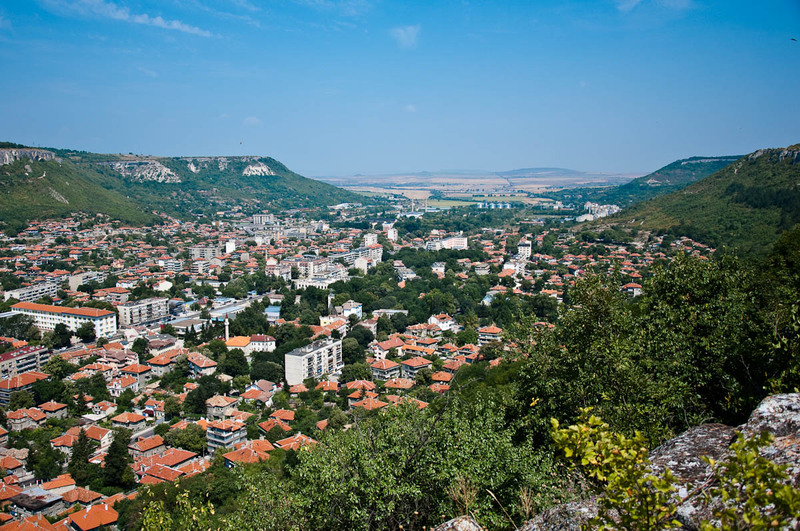 They restored the fortress and it became an important administrative and military centre in the fledgling country defending the first Bulgarian capitals Pliska and Preslav. This is when it was given the name ‘Ovech’ (from the word ‘овен’, pronounced ‘oven’ which means ‘ram’ in Bulgarian). Up to the 14th century the fortress was immune against attack. It was only in 1388 that it was taken with deceit by the advancing Ottoman armies. 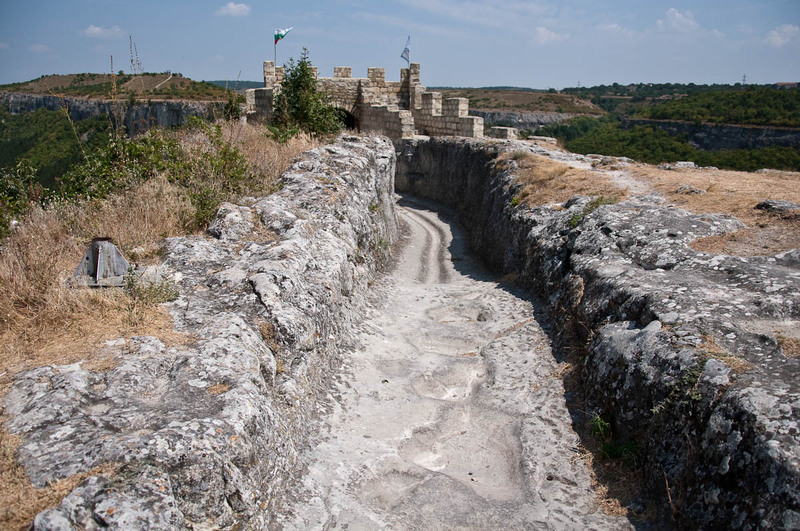 The fortress was reconquered from them twice more, but after the whole of Bulgaria was enslaved by the new occupiers, Ovech eventually was taken by the Ottomans again who used it until the 17th century and then forever abandoned it. Yes, I was really intrigued. And I really wanted to see it all for myself. 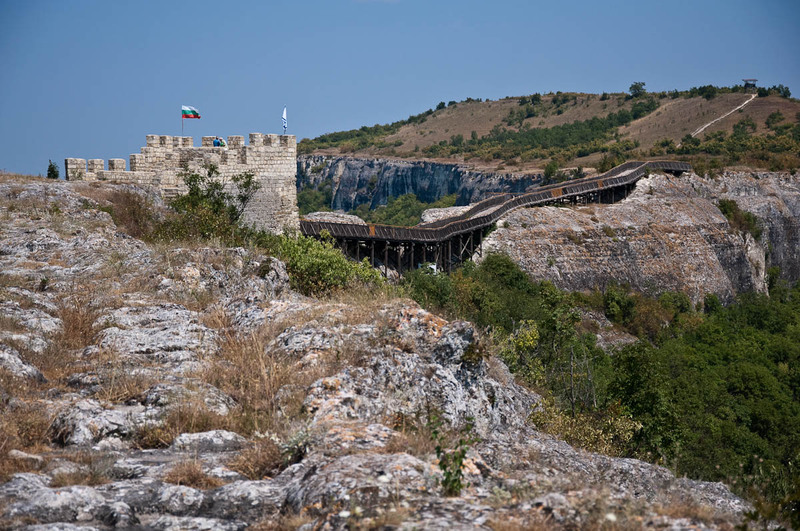 As such, I put ‘Ovech Fortress’ under number one on my to-do list for the three weeks I was to spend in Bulgaria between July and August 2016. And so I did. I went, I saw it and I was captivated by it all. A huge place spread wide on a high plateau taken over by wild grasses and covered with rough rocks between which the remains of what once had been a powerful military settlement quietly stood in the hot sun. A perfect reminder of how futile is all, of how time takes it all away, leaving behind just a little of this and a little of that to show us how random is the principle of what survives and what perishes forever around us. But, yes, OK, let’s not get bogged down with philosophical thoughts. 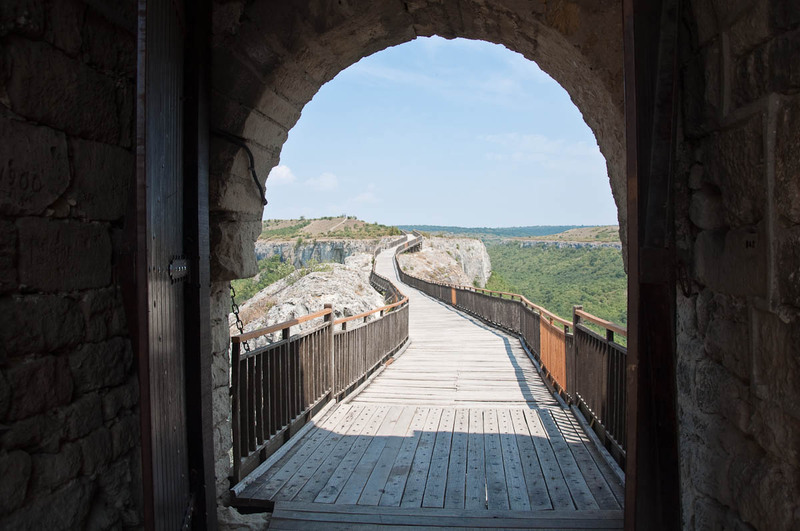 Instead, let me show you Ovech Fortress the way I experienced it, so that you can also put it in your must-see travel lists and crave to see it soon. It was a hot and sweaty summer day when we piled in my father’s car (thanks, Dad, for letting us borrow it!) 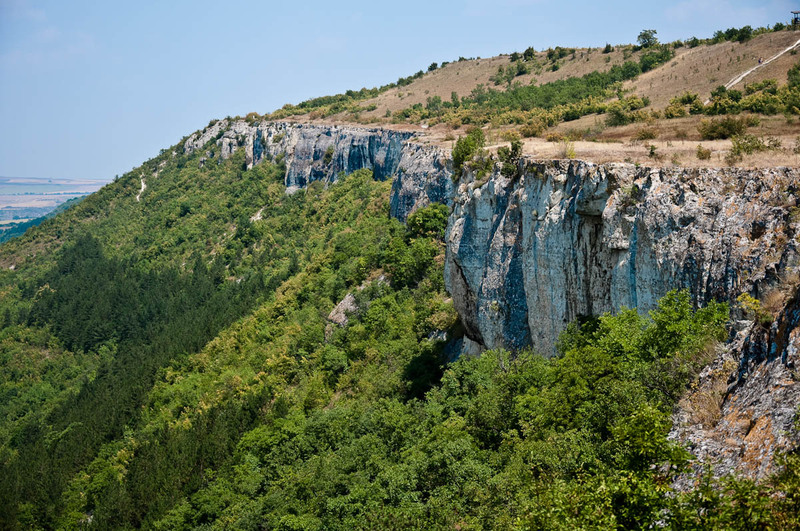 and headed to Provadia – a small town about an hour away from Varna on the Bulgarian Black Sea Coast. The highway took us past the town of Devnya – a Roman settlement in the past and an industrial centre with huge factories in the present. Then fields of gold sunflowers surrounded us on both sides and before we knew it, we had exited the highway and traveled down a small road with quite a few potholes, only some of which had been roughly patched up. A turn to the right and we were on the outskirts of Provadia which intrigued me with its mixture of family houses with vine trellis in their front yards and old Soviet-style panel blocks of flats which looked a bit run down and less than inspiring. On both sides of the town huge cliffs proudly stood up. Here and there, the bare rocks had broken free from the lush shrubs and trees and stuck out their naked rugged faces towards the baking hot sun. It was a stunning sight. We followed the brown signs pointing first straight ahead for about two kilometres into the town and then indicating a sharp turn to the left. A smiling group of locals waved us ahead: ‘Keep driving up the hill, they said. You will see where to stop.’ And so, they were right. 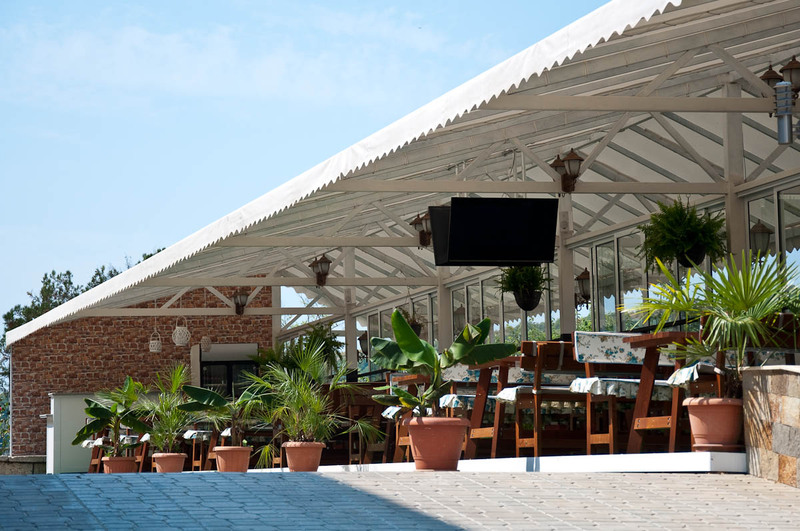 The car approached a hotel with a large restaurant attached to it halfway up the hill. From there, we had to continue on foot. A small metal hut served as the ticket office, which, however, was shut. There was no-one around to ask what was going on and to whom to pay the humble entrance fee of 2 leva (1 euro), so eventually we followed the eco-path leading up to the fortress on the rocks. The eco-path bent and turned taking us higher and higher up the hill. The ascent was not difficult at all and we walked through the forest grateful for the temporary respite from the burning sun. 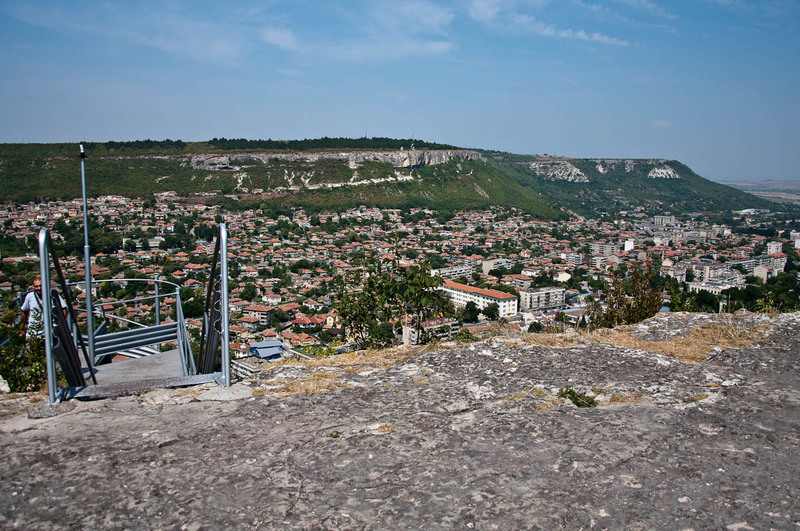 by going up a thin straight metal staircase which then connected with the old steps carved in the rock which the soldiers of centuries ago used to reach the fortress. 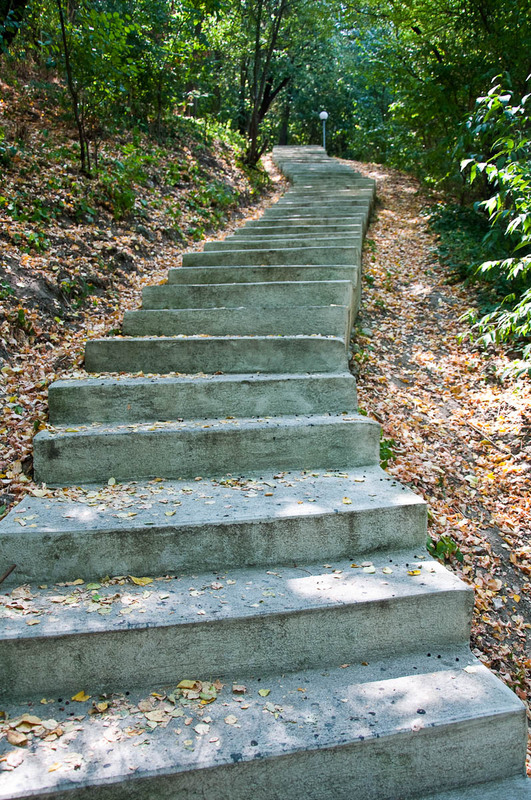 These old steps were broken down and uneven, but not difficult to scale at all. Well, we tried them both. Pictures had to be taken from every possible angle, you see. 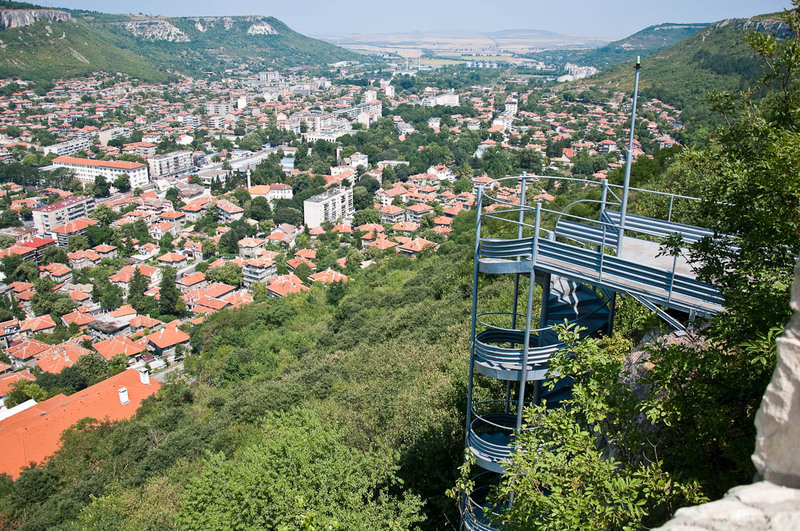 I spent a long time perched on the spiral staircase snapping away at the town below. It was a strange sensation being up there suspended (bar the metal railings around me) in the air. A bit unnerving, I must add, as I kept imaging what would happen if I lost my balance, but still a rather freeing sensation, nevertheless. Then, hop, and we were right atop of the plateau captivated by the breathtaking views around us. A small crenelated defense tower had been built right where the staircases ended, giving us an ever higher viewpoint over the valley below. We spent a few minutes there just taking it all in. 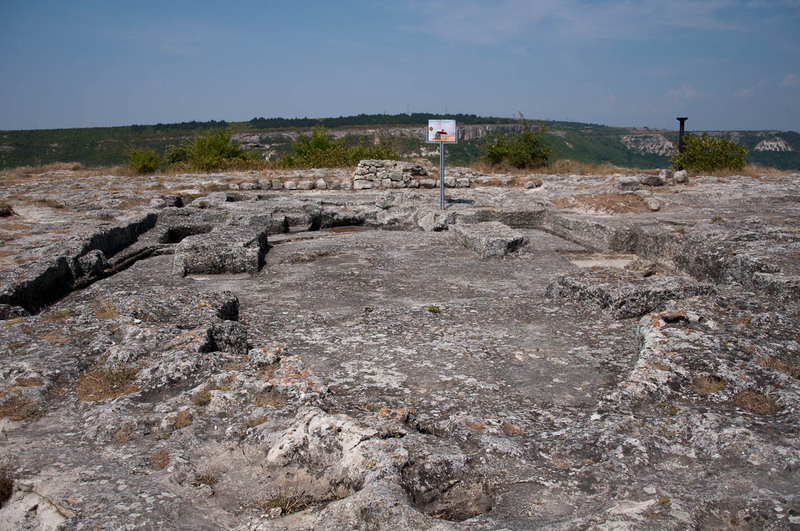 Then we turned around and started to explore the plateau and what had remained of Ovech Fortress. My first impression was how few people there were. Perhaps less than twenty spread out over the huge space. Ovech Fortress, definitely, was not overrun with tourists, like other sights which are closer to Varna and rather more popular. It was instead very peaceful and very inviting to spend time there, as much as you liked, without having to squeeze past eager selfie-stick holding hordes. 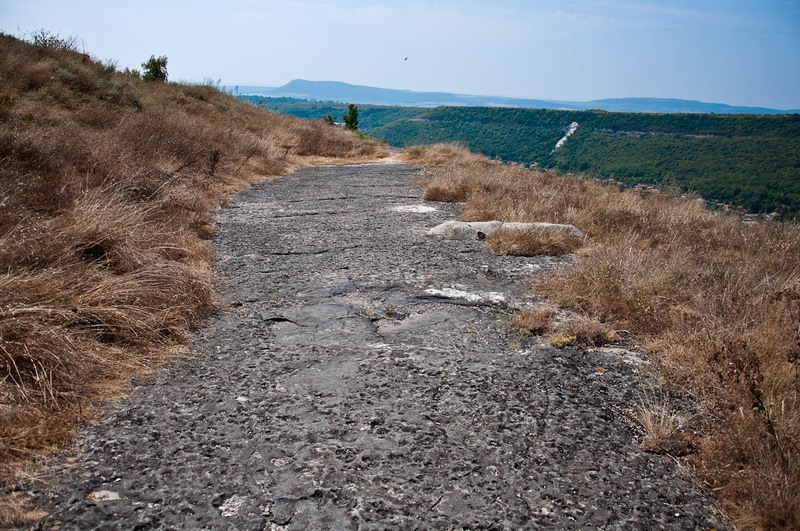 And so we went for a walk, following the curving paths running through the plateau. Far ahead in the distance we could see the wooden bridge, but before we reached it, there were so many other things to be seen. 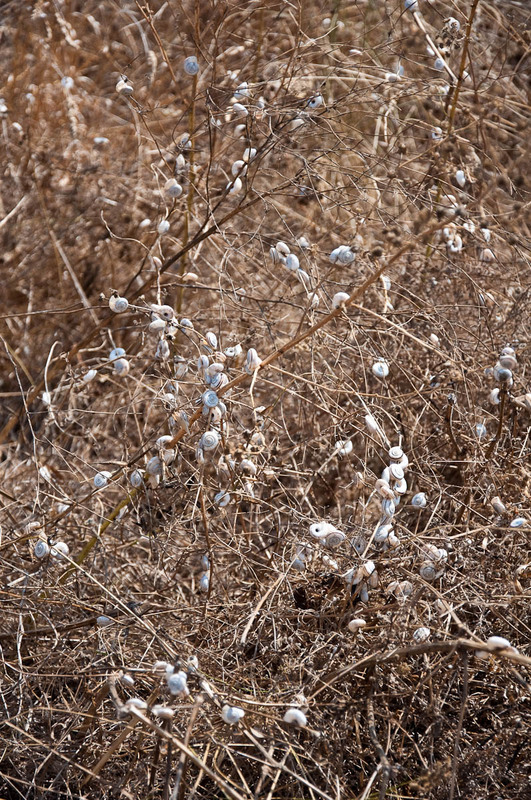 A tangled mess of yellow grass, burnt by the sun, was covering big patches of the plateau. 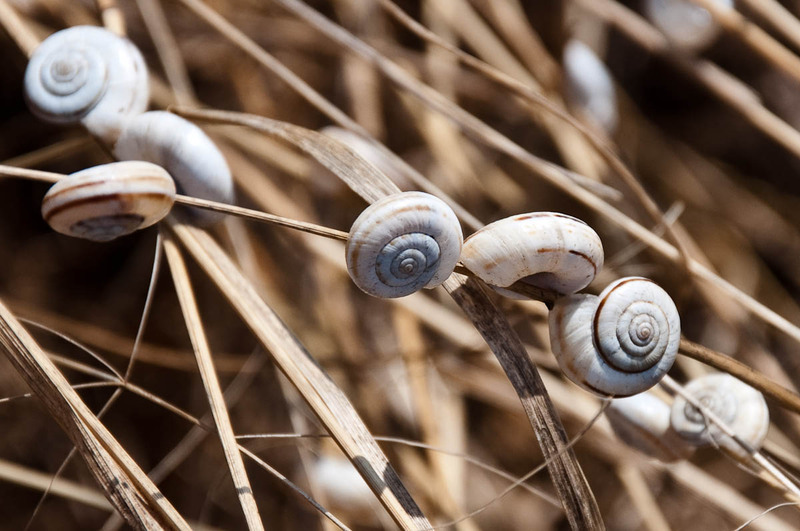 Curiously, the blades of grass were housing large clusters of tiny white snails. The faint wind would swing them back and forth and the baby snails would hold on for dear life. We also spotted some hare tracks. Further away the ruins stood still. 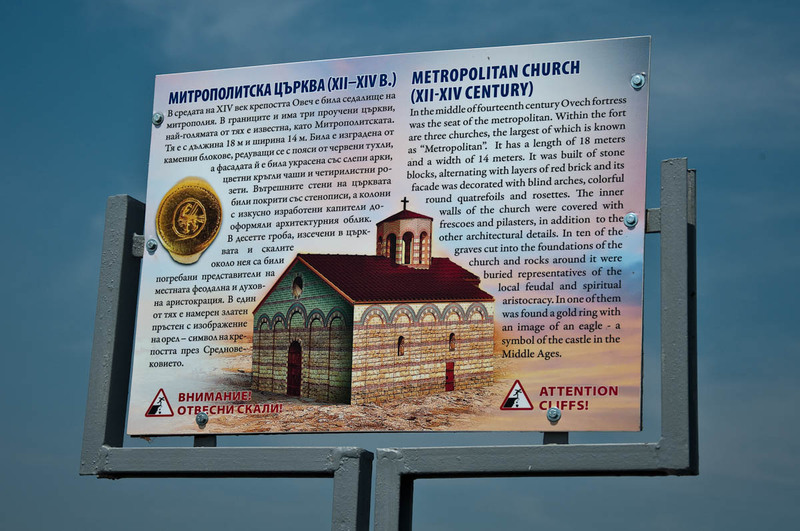 At one point there were three churches in Ovech, one of which a metropolitan one. Now they had been reduced to tiny ruins but an information board gave us a good idea how splendid they must have been in their heyday. We also saw the tombs deeply carved in the rock around the churches. They were empty now and stood open under the sky, a clear reminder of how transient the human body is. Houses for the population of the fortress had been built along one of the cliffs’ edges. 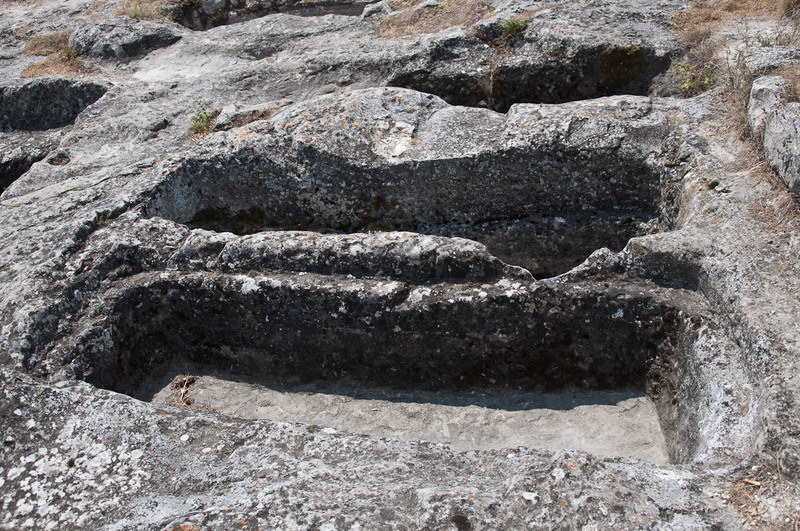 You could still see where their foundations had been carved straight into the rock. Several wells ensured the water supply of the fortress with one of them 80 metres deep. Apparently, local people still believe that the well was used as an escape tunnel, too. As for food, it is said that large quantities of grains and foodstuffs used to be stored in the big caves underneath the fortress itself to sustain its inhabitants during the long sieges it suffered. We also saw the ruins of the guards’ rooms and the noblemen’s prison where, history states, three of the knights of Amadeus IV, Count of Savoy, were imprisoned before Byzantium interceded on their behalf. We were now nearing the Northern Gate – which used to be the main entrance of the fortress. Nowadays, a defense tower has been built where the original had once stood. 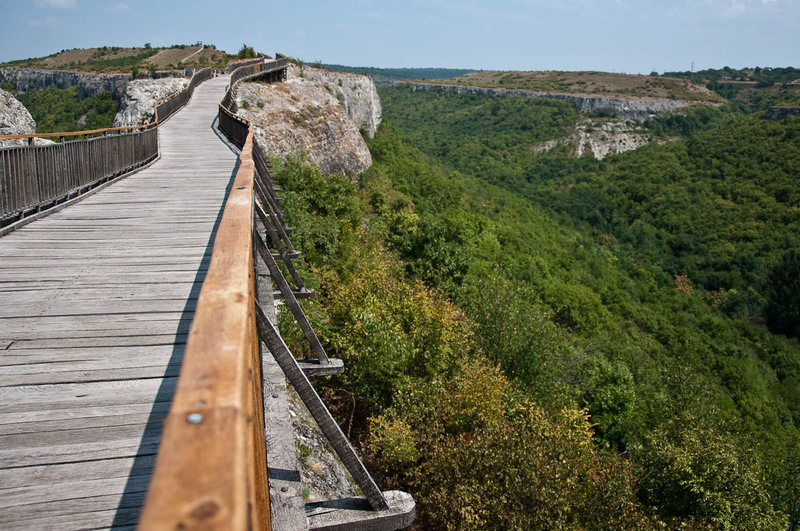 Also in the present day a wide wooden bridge 160 meters long, has been built where before a drawbridge had ensured the defense of the fortress. The current bridge connects the Ovech plateau with the adjacent Tabiite plateau (‘tabia’ meaning ‘fortification’ in Turkish). I spent a long time walking slowly on this long and curving bridge from end to end. The sensation once again was of being suspended high up in the air, of being free. Perhaps not quite as a bird, but close in terms of the spectacular views. The town of Provadia was on the left and a deep lush valley on my right hand side. I thought I could hear a river singing down below in the shadows of the dense trees. The wooden planks creaked underneath my footsteps and through a tiny gap between two of them I could glimpse the solid structure of the bridge bellow supported by the rock straight underneath. The big map at the entrance to the eco-path at the bottom of the hill had indicated that if we continued walking once the bridge had finished and along the Tabiite plateau we would come across thirty Thracian rock tombs, the ruins of a Roman supporting wall, some rock monasteries, two more wells as well as thirteen protected plant species. The sun was burning us like hot coal though, so I solemnly promised that we would return to Ovech Fortress in the not too distant future to continue exploring the cliffs beyond the end of the bridge. 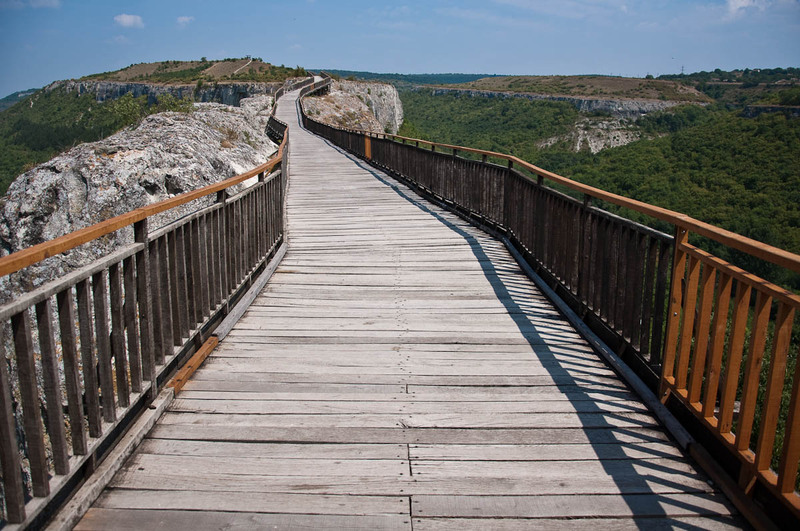 In spite of the really hot summer weather (definitely bring water with you and wear shoes with good grip), I loved spending time at Ovech Fortress, following the paths through its ruins and walking on its wooden bridge. It definitely isn’t the most preserved fortress you would ever come across. Quite the opposite in fact. But it is a breathtaking place where you can ponder the fleetingness of life and be at peace with it. Have you been to Ovech Fortress? What was your experience up there on the plateau? Also, tell me which are your most favourite ancient fortresses or strongholds anywhere in the world you have had the chance to see. I would love to read your comments in the section below.